With the Exodus from Egypt of Moses and his followers, (the first stage of their move to Canaan), we come to an event of great importance. It is an established historical event which appears in a known context, in spite of occasional allegations one finds which tend to attribute to it a largely legendary character. In the Old Testament, the Exodus forms the second book of the Pentateuch or Torah, along with a narration of the journey through the wilderness and the alliance (covenant) concluded with God on Mount Sinai. It is natural for the Qur'an to devote a great deal of space to it too: an account of the dealings Moses and his brother Aaron had with the Pharaoh and of the exit from Egypt is found in more than ten suras containing long descriptions, e.g. suras, 7, 10, 20 and 26, along with more abridged versions and even simple reminders. The name of Pharaoh, the main character on the Egyptian side, is repeated (to the best of my knowledge) seventy-four times in the Qur'an in 27 suras. A study of both the Qur'anic and Biblical narrations is especially interesting here because, in contrast to what has been noted in the case of the Flood (for example), in the main, the two narrations have many points in common. There are certainly divergences, but the Biblical narration has considerable historical value, as we shall see. This is because it helps to identify the Pharaoh, or rather the two pharaohs in question. This hypothesis, which starts with the Bible, is complemented by the information contained in the Qur'an. Modern data are added to these two Scriptural sources and it is thus possible, through a confrontation between the Bible, the Qur'an and today's knowledge, to situate this episode from the Holy Scriptures in a historical context. "Now there arose a new king over Egypt, who did not know Joseph." The period of oppression followed; the Pharaoh ordered the Jews to build the cities of Pithom and Ramesses (to use the names given to them in the Bible) (Exodus I, 11). To avoid a population explosion among the Hebrews, Pharaoh ordered each new-born son to be thrown into the river. Moses was nevertheless preserved by his mother for the first three months of his life before she finally decided to put him in a rush basket on the river's edge. The Pharaoh's daughter discovered him, rescued him and gave him to a nurse, none other than his own mother. This was because Moses's sister had watched to see who would find the baby, had pretended not to recognize him and then recommended to the Princess a nurse who was really the child's mother. He was treated as one of the Pharaoh's sons and given the name 'Moses'. "In the course of those many days the king of Egypt died." God ordered Moses to go and find the Pharaoh and lead his brothers out of Egypt (the description of this order is given in the episode of the Burning Bush). Aaron, Moses's brother, helped him in this task. This is why Moses, once he had returned to Egypt, went with his brother to visit the Pharaoh who was the successor of the king under whose reign he had long ago been born. The Pharaoh refused to allow the Jews in Moses's group to leave Egypt. God revealed Himself to Moses once again and ordered him to repeat his request to Pharaoh. According to the Bible, Moses was eighty years old at this time. Through magic, Moses showed the Pharaoh that he had supernatural powers. This was not enough however. God sent the famous plagues down upon Egypt. The rivers were changed into blood, there were invasions of frogs, gnats and swarms of flies, the cattle died, boils appeared on men and animals, there was hail and plagues of locusts, darkness and the death of the first-born. Nevertheless, the Pharaoh still did not allow the Hebrews to leave. They therefore broke out of the city of Rameses, 600,000 of them [ We shall later see that the figure has been grossly exaggerated.] "besides women and children" (Exodus 12, 37). At this point Pharaoh "made ready his chariot and took his army .With him, and took six hundred picked charioteers and all the other chariots of Egypt with officers over all of them . . . Pharaoh, king of Egypt, pursued the people of Israel as they went forth defiantly." (Exodus 14, 6 and 8). The Egyptians caught up with Moses's party beside the sea. Moses raised his staff, the sea parted before him and his followers walked across it without wetting their feet. "The Egyptians pursued and went in after them into the midst of the sea, all Pharaoh's horses, his chariots, and his horsemen." (Exodus 14, 23) "The waters returned and covered the chariots and the horsemen and all the host of Pharaoh that had followed them into the sea; not so much as one of them remained. But the people of Israel walked on dry ground through the sea, the waters being a wall to them on their right hand and on their left." (Exodus 14, 28-29). The text of Exodus is quite clear: Pharaoh was at the head of the pursuers. He perished because the text of Exodus notes that "not so much as one of them remained." The Bible repeats this detail moreover in the Psalms: Psalm 106, verse 11 and Psalm 136 verses 13 and 15 which are an act of thanks to God "Who divided the sea of Rushes [ In Hebrew 'yam souf'.] in sunder . . . and made Israel pass through the midst of it . . . but overthrew Pharaoh and his host in the sea of Rushes." There can be no doubt therefore, that according to the Bible, the Pharaoh of the Exodus perished in the sea. The Bible does not record what became of his body. 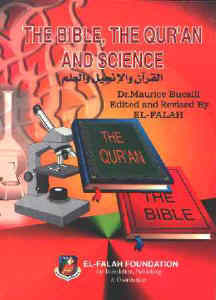 In its broad outlines, the narration of the Exodus contained in the Qur'an is similar to that of the Bible. It has to be reconstituted, however, because it is made up of passages dispersed throughout the Book. The Qur'an does not provide a name which enables us to identify who the reigning Pharaoh was at the time of Exodus, any more than the Bible does. All that is known is that one of his counsellors was called Haman. He is referred to six times in the Qur'an (sura 28, verses 6, 8 and 38, sura 29, verse 39 and sura 40, verses 24 and 36). "When Moses said to his people: Remember the favor of God to you when He delivered you from Pharaoh's folk who imposed upon you a dreadful torment, slaughtered your sons and spared your women." The oppression is recalled in the same terms in verse 141, sura 7. The Qur'an does not however mention the names of the cities built by the Jews in subjection, as does the Bible. "The family of Pharaoh took him up. (It was intended) that (Moses) should be to them an adversary and a cause of sorrow. Pharaoh, Haman and their hosts were sinners. Pharaoh's wife said: (He will be) a joy to the eye for me and you. Don't kill him. He may be of use to us or we may take him as a son. They did not sense (what was to come)." Muslim tradition has it that it was Pharaoh's wife Asiya who took care of Moses. In the Qur'an, it was not the Pharaoh's wife who found him, but members of his household. Moses's youth, his stay in Midian and marriage are described in sura 28, verses 13 to 28. In particular, the episode of the Burning Bush is found in the first part of sura 20, and in sura 28, verses 30 to 35. The Qur'an does not describe the ten plagues sent down upon Egypt as a divine chastisement (unlike the long description in the Bible), but simply mentions five plagues very briefly (sura 7, verse 133): flooding, locusts, lice, frogs, and blood. The flight from Egypt is described in the Qur'an, but without any of the geographical data given in the Bible, nor the incredible numbers of people mentioned in the latter. It is difficult to imagine how 600,000 men plus their families could have stayed in the desert for a long time, as the Bible would have us believe. "Pharaoh pursued them with his hosts and the sea covered them." The Jews escaped. Pharaoh perished, but his body was found: a very important detail not mentioned in the Biblical narration. "We took the Children of Israel across the sea. Pharaoh with his hosts pursued them in rebellion and hostility till, when the fact of his drowning overtook him, he said: I believe there is no God except the God in whom the Children of Israel believe. I am of those who submit themselves to Him. "God said: 'What? Now !. Thou has rebelled and caused depravity. This day We save thee in thy body so that thou mayest be a sign for those who come after thee.' But verily, many among mankind are heedless of Our signs." a) The spirit of rebellion and hostility referred to is to be understood in terms of Moses's attempt to persuade the Pharaoh. --the absence in the Qur'an of place names, both of the cities built by the Hebrews in Moses's group, and on the route taken by the Exodus. --the absence of any reference to the death of a Pharaoh during Moses's stay in Midian. --the absence in the Qur'an of details concerning Moses's age when he addressed his request to the Pharaoh. --the absence of any mention in the Bible of the rescue of the Pharaoh's body after his death. --the confirmation contained in the Qur'an of Pharaoh's oppression of the Jews in Moses's group. --the absence from both narrations of any mention of the King of Egypt's name. --the confirmation contained in the Qur'an of the Pharaoh's death during the Exodus. The narrations contained in the Bible and the Qur'an on the time spent by the sons of Israel in Egypt, and the way they left, give rise to data which may constitute matter for a confrontation with modern knowledge. In fact, the balance is very uneven because some data pose many problems while others hardly provide subject for discussion. It is, apparently, quite possible to say (and without running much risk of being wrong) that the Hebrews remained in Egypt for 400 or 430 years, according to the Bible (Genesis 15, 13 and Exodus 12, 40). In spite of this discrepancy between Genesis and Exodus, which is of minor importance, the period may be said to have begun long after Abraham, when Joseph, son of Jacob, moved with his brothers to Egypt. With the exception of the Bible, which gives the data just quoted, and the Qur'an which refers to the move to Egypt, but does not give any indication as to the dates involved, we do not possess any other document which is able to illuminate us on this point. Present-day commentators, ranging from P. Montet to Daniel Rops, think that, in all probability, the arrival of Joseph and his brothers coincided with the movement of the Hyksos towards Egypt in the Seventeenth century B.C. and that a Hyksos sovereign probably received them hospitably at Avaris in the Nile Delta. examining this reference in Kings I.] We shall see how the theory put forward here has only this objection, taken from Kings I, to be levelled against it. The very obvious inaccuracy of these chronological data effectively deprives this objection of any value. "They are not members of the local population, they do not identify themselves with a class in society, they do not all share the same occupation or status." Under Tuthmosis III, they are referred to in a papyrus as 'workers in the stables'. It is known how Amenophis II, in the Fifteenth century B.C., brought in 3,600 of these people as prisoners from Canaan, because, as Father. de Vaux notes, they constituted a considerable percentage of the Syrio-Palestinian population. Under Sethos I, in circa 1300 B.C., the 'Apiru created considerable disturbances in the Beth-Shean region of Canaan, and under Ramesses II some of them were employed in the quarries or for transporting piles used in the works of the Pharaoh (e.g. the Great Pylon of Ramesses Miamon). We know from the Bible that the Hebrews, under Ramesses II, were to build the northern capital, the City of Ramesses. In Egyptian writings the 'Apiru are mentioned once again in the Twelfth century B.C. and for the last time under Ramesses III. The 'Apiru are not just mentioned in Egypt however, so did the term therefore apply solely to the Hebrews? It is perhaps wise to recall that the word could initially have been used to signify 'forced labourers', without regard to their origins, and that it subsequently became an adjective indicating a person's profession. We might perhaps draw an analogy with the word 'suisse' (Swiss) which has several different meanings in French. It can mean an inhabitant of Switzerland, a mercenary soldier of the old French monarchy who was of Swiss extraction, a Vatican guard, or an employee of a Christian church . . . However, this may be, under Ramesses II, the Hebrews (according to the Bible) or the 'Apiru (according to the hieroglyphic texts) took part in the great works ordered by the Pharaoh, which were indeed 'forced labour'. There can be no doubt that Ramesses II was the Jews' oppressor: the cities of Ramesses and Pithom, mentioned in Exodus, are situated at the eastern part of the Nile Delta. Today's Tanis and Qantir, which are roughly 15 miles apart, are in the same region as these two cities. The northern capital constructed by Ramesses II was situated there. Ramesses II is the Pharaoh of the oppression. Moses was to be born in this environment. The circumstances pertaining to his rescue from the waters of the river have al- ready been outlined above. He has an Egyptian name: P. Montet has clearly shown in his book Egypt and the Bible (L'Egypte et la Bible) [ Pub. Delachaux and Niestlé, Neufchatel, 1959.] that the names Mesw or Mesy are on the list of personal names in the dictionary of the hieroglyphic language by Ranke. Musa is the transliteration used in the Qur'an. Under this title the Bible refers to ten punishments inflicted by God, and provides many details concerning each of these 'plagues'. Many have supernatural dimensions or characteristics. The Qur'an only lists five plagues, which, for the most part, are merely an exaggeration of natural phenomena: flooding, locusts, lice, frogs and blood. The rapid multiplication of locusts and frogs is described in the Bible. It speaks of river water changed to blood which floods all the land (sic); the Qur'an refers to blood, but without giving any complementary details. It is possible to invent all kinds of hypotheses on the subject of this reference to blood. The other plagues described in the Bible (gnats, swarms of flies, boils, hail, darkness, death of the first-born and of cattle) have various origins, as was the case of the Flood, and are constituted by the juxtaposition of passages from many different sources. No indication of this is given in the Qur'an, whereas the Bible refers to it in great detail. Father de Vaux and P. Montet have both reopened studies into it. The starting-point was probably the Tanis-Qantir region, but no traces have been found of the rest of the route taken which could confirm the Biblical narration; nor is it possible to say at exactly what point the waters parted to allow the passage of Moses and his followers. Some commentators have imagined a tide-race, due perhaps to astronomic causes or seismic conditions connected to the distant eruption of a volcano. The Hebrews could have taken advantage of the receding sea, and the Egyptians, following in hot pursuit, could have been wiped out by the returning tide. All this is pure hypothesis however. It is possible to arrive at much more positive evidence in the case of the point the Exodus occupies in time. For a very long time Merneptah, the successor to Ramesses II, was held to be the Pharaoh of the Exodus. Maspero, the famous Egyptologist of the beginning of this century did, after all, write in his Visitor's Guide to the Cairo Museum (Guide du visiteur du Musée du Caire), 1900, that Merneptah "was probably, according to the Alexandrian tradition, the Pharaoh of the Exodus who is said to have perished in the Red Sea." I have been unable to find the documents on which Maspero based this assertion, but the eminence of this commentator requires us to attach the greatest importance to what he claims. Apart from P. Montet, there are very few Egyptologists or specialists in Biblical exegesis who have researched into the arguments for or against this hypothesis. In the last few decades however, there has been a spate of different hypotheses which seem to have as their sole purpose the justification of an agreement with one single detail in the Scriptural narrations, although the inventors of these hypotheses do not bother with the other aspects of the Scriptures. Thus it is possible for a hypothesis to suddenly appear which seems to agree with one aspect of a narration, although its inventor has not taken the trouble to compare it with all the other data contained in the Scriptures (and consequently not just with the Bible), plus all the data provided by history, archaeology, etc. One of the strangest hypotheses yet to come to light is by J. de Miceli (1960) who claims to have pinpointed the date of the Exodus to within one day, i.e. the 9th of April, 1495 B.C. He relies for his information entirely on calculations made from calendars and claims that Tuthmosis II was reigning in Egypt at that time, and was therefore the Pharaoh of the Exodus. The confirmation of the hypothesis is supposed to reside in the fact that lesions of the skin are to be observed on the mummy of Tuthmosis II. This commentator informs us (without explaining why) that they are due to leprosy, and that one of the plagues of Egypt described in the Bible consisted in skin boils. This staggering construction takes no account of the other facts contained in the Biblical narration, especially the Bible's mention of the City of Ramesses which rules out any hypothesis dating the Exodus before a 'Ramesses' had reigned. As to the skin lesions of Tuthmosis II, these do not swing the argument in favour of the theory which designates this King of Egypt as the Pharaoh of the Exodus. This is because his son, Tuthmosis III, and his grandson Amenophis II also show signs of skin tumors [ The skin lesions are clearly visible on the mummies of these Pharaohs preserved in the Egyptian Museum, Cairo. ], so that some commentators have suggested the hypothesis of a disease which ran in the family. The Tuthmosis II theory is not therefore tenable. The same is true for Daniel-Rops's theory in his book. The People of the Bible (Le Peuple de la Bible) [ Pub. Desclée de Brouwer, 1970, Paris.]. He ascribes the role of the Pharaoh of the Exodus to Amenophis II. It does not seem to be any better-founded than the preceding hypothesis. Using the pretext that Amenophis II's father (Tuthmosis III) was very nationalistic, Daniel-Rops proclaims Amenophis II the persecutor of the Hebrews, while his step-mother, the famous Queen Hatshepsut, is cast in the role of the person who took Moses in (although we never discover why). Father de Vaux's theory, that it was Ramesses II, rests on slightly more solid foundations. He expands on them in his book, The Ancient History of Israel (Histoire ancienne d'Israël) [ Pub. J. Gabalda and Co., 1971, Paris.]. Even if his theory does not agree with the Biblical narration on every point, at least it has the advantage of putting forward one very important piece of evidence: the construction of the cities of Ramesses and Pithom built under Ramesses II referred to in the Biblical text. It is not possible therefore to maintain that the Exodus took place before the accession of Ramesses II. This is situated in the year 1301 B.C., according to Drioton and Vandier's chronology, and in 1290 B.C. according to Rowton's. The two other hypotheses outlined above are untenable because of the following imperative fact: Ramesses II is the Pharaoh of the oppression referred to in the Bible. Father de Vaux considers the Exodus to have taken place during the first half or towards the middle of Ramesses II's reign. Thus his dating of this event is imprecise: he suggests this period to allow Moses and his followers time, as it were, to settle in Canaan, and Ramesses II's successor, Pharaoh Mernaptah who is said to have pacified the frontiers after his father's death, to bring the Children of Israel into line, as depicted on a stele of the Fifth year of his reign. a) The Bible shows (Exodus 2, 23) that the King of Egypt died during the period when Moses was in Midian. This King of Egypt is described in the Book of Exodus as the King who made the Hebrews build the cities of Ramesses and Pithom by forced labour. This King was Ramesses II. The Exodus could only have taken place under the latter's successor. Father de Vaux claims however to doubt the Biblical sources of verse 23, chapter 2 of Exodus. b) What is more astounding is that Father de Vaux, as director of the Biblical School of Jerusalem, does not refer in his theory of the Exodus to two essential passages in the Bible, both of which bear witness to the fact that the King died during the pursuit of the fleeing Hebrews. This detail makes it impossible for the Exodus to have taken place at any other time than at the end of a reign. It must be repeated that there can be little doubt that the Pharaoh lost his life as a result of it. Chapters 13 and 14 of Exodus are quite specific on this point: "So he made ready his chariot and took his army with him . . ." (Exodus 14,6). (Pharaoh king of Egypt) "pursued the people of Israel as they went forth defiantly" (Exodus 14,8) . . . "The waters returned and covered the chariots and the horsemen and all the host of Pharaoh that had followed them into the sea; not so much as one of them remained." (Exodus 14,28 and 29). In addition to these verses, Psalm 136 confirms Pharaoh's death and refers to Yahweh who "overthrew Pharaoh and his host in the Sea of Rushes" (Psalms 136,15). Thus, during Moses's lifetime, one Pharaoh died when Moses was in Midian and another during the Exodus. There were not one, but two Pharaohs at the time of Moses: one during the oppression and the other during the Exodus from Egypt. The theory of a single Pharaoh (Ramesses II) put forward by Father de Vaux is unsatisfactory because it does not account for everything. The following observations are further arguments against his theory. P. Montet has very discerningly resumed the original Alexandrian [ There can be no doubt that in the Golden Age of the ptolemies, historical documents on Antiquity were preserved at Alexandria, only to be destroyed at the time of the Roman conquest; a loss which is keenly felt today.] tradition mentioned by Maspero. It is found much later in the Islamic tradition as well as in the classic Christian tradition. [ In the Holy Histories of the early 20th century, as in the History by Abbe H. Lesetre, intended for religious instruction, the Exodus is mentioned as having taken place during Merneptah's reign in Egypt.] This theory is set out in Montet's book Egypt and the Bible (L'Egypte et le Bible) [ Pub. Delachaux and Niestlé, Neuchatel, 1959.] and is supported by additional arguments, based in particular on the narrative contained in the Qur'an, to which the famous archaeologist did not refer. Before examining them however, we shall first return to the Bible. The Book of Exodus contains a reference to the word 'Ramesses' although the Pharaoh's name is not mentioned. In the Bible 'Ramesses' is the name of one of the cities built by the forced labour of the Hebrews. Today we know that these cities form part of the Tanis-Qantir region, in the eastern Nile Delta. In the area where Ramesses II built his northern capital, there were other constructions prior to his, but it was Ramesses II who made it into an important site, as the archeological excavations undertaken in the last few decades have amply shown. To build it, he used the labour of the enslaved Hebrews. When one reads the word 'Ramesses' in the Bible today, one is not particularly struck by it: the word has become very common to us since Champollion discovered the key to hieroglyphics 150 years ago, by examining the characters that expressed this very word. We are therefore used to reading and pronouncing it today and know what it means. One has to remember however that the meaning of hieroglyphics had been lost in circa the Third century B.C. and that Ramesses' name had hardly been preserved anywhere except in the Bible and a few books written in Greek and Latin which had deformed it to a lesser or greater extent. It is for this reason that Tacitus in his Annals talks of 'Rhamsis'. The Bible had however preserved the name intact: it is referred to four times in the Pentateuch or Torah (Genesis 47,11; Exodus 1,11 and 12,37. Numbers 33,3 and 33,5). The Hebrew word for 'Ramesses' is written in two ways in the Bible: 'Râ(e) mss' or 'Râeâmss' [ The letter 'e' figures as the ayin in Hebrew.]. In the Greek version of the Bible, called the Septuagint, it is 'Râmessê'. In the Latin version (Vulgate) it is written 'Ramesses'. In the Clementine version of the Bible in French (1st edition, 1621) the word is the same, 'Ramesses'. The French edition was in circulation at the time of Champollion's work in this field. In his Summary of the Hièroglyphic System of the Ancient Egyptians (Precis du systeme hiéroglyphique des anciens Egyptiens) (2nd edition, 1828, page 276), Champollion alludes to the Biblical spelling of the word. a) There can be no question of the Exodus before a 'Ramesses' had come to the throne in Egypt (11 Kings of Egypt had this name). b) Moses was born during the reign of the Pharaoh who built the cities of Ramesses and Pithom, i.e. Ramesses II. c) When Moses was in Midian, the reigning Pharaoh (i.e. Ramesses II) died. The continuation of Moses's story took place during the reign of Ramesses II's successor, Merneptah. What is more, the Bible adds other highly important data which help to situate the Exodus in the history of the Pharaohs. It is the statement that Moses was eighty years old when, under God's orders, he tried to persuade Pharaoh to free his brothers: "Now Moses was eighty years old, and Aaron eighty-three years years old, when they spoke to Pharaoh." (Exodus 7,7). Elsewhere however, the Bible tells us (Exodus 2,23) that the Pharaoh reigning at the time of the birth of Moses died when the latter was in Midian, although the Biblical narration continues without mentioning any change in the sovereign's name. These two passages in the Bible imply that the total number of years spanning the reigns of the two Pharaohs ruling at the time when Moses was living in Egypt must have been eighty years at least. It is known that Ramesses II reigned for 67 years (1301-1235 B.C. according to Drioton and Vandier's chronology, 1290-1224 B.C. according to Rowton). For Merneptah, his successor, the Egyptologists are unable, however, to provide the exact dates of his reign. Nevertheless, it lasted for at least ten years because, as Father de Vaux points out, documents bear witness to the tenth year of his reign. Drioton and Vandier give two possibilities for Merneptah: either a ten-year reign, 1234-1224 B.C., or a twenty-year reign 1224-1204 B.C. Egyptologists have no precise indications whatsoever on how Merneptah's reign came to an end: all that can be said is that after his death, Egypt went through a period of serious internal upheavals lasting nearly 25 years. Even though the chronological data on these reigns are not very precise, there was no other period during the New Kingdom concordant with the Biblical narration when two successive reigns (apart from Ramesses II-Merneptah) amounted to or surpassed eighty years. The Biblical data concerning Moses's age when he undertook the liberation of his brothers can only come from a time during the successive reigns of Ramesses II and Merneptah [ The period spanning the two reigns Sethos I-Ramesses II, which is said to have lasted roughly eighty years, is out of the question: Sethos I's reign-which was too short for this-does not square with the very long stay in Midian which Moses made as an adult and which took place during the reign of the first of the two Pharaohs he was to know.]. All the evidence points towards the fact that Moses was born at the beginning of Ramesses II's reign, was living in Midian when Ramesses II died after a sixty-seven year reign, and subsequently became the spokesman for the cause of the Hebrews living in Egypt to Merneptah, Ramesses II's son and successor. This episode may have happened in the second half of Merneptah's reign, assuming he reigned twenty years or nearly twenty years. Rowton believes the supposition to be quite feasible. Moses would then have led the Exodus at the end of Merneptah's reign. It could hardly have been otherwise because both the Bible and the Qur'an tell us that Pharaoh perished during the pursuit of the Hebrews leaving the country. This plan agrees perfectly with the account contained in the Scriptures of Moses's infancy and of the way he was taken into the Pharaoh's family. It is a known fact that Ramesses II was very old when he died: it is said that he was ninety to a hundred years old. According to this theory, he would have been twentythree to thirty-three years old at the beginning of his reign which lasted sixty-seven years. He could have been married at that age and there is nothing to contradict the discovery of Moses by 'a member of Pharaoh's household' (according to the Qur'an), or the fact that Pharaoh's wife asked him if he would keep the newly-born child she had found on the bank of the Nile. The Bible claims that the child was found by Pharaoh's daughter. In view of Ramesses II's age at the beginning of his reign it would have been perfectly possible for him to have had a daughter old enough to discover the abandoned child. The Qur'anic and Biblical narrations do not contradict each other in any way on this point. The theory given here is in absolute agreement with the Qur'an and is moreover at odds with only one single statement in the Bible which occurs (as we have seen) in Kings I 6,1 (N.B. this book is not included in the Torah). This passage is the subject of much debate and Father de Vaux rejects the historical data contained in this part of the Old Testament, which dates the Exodus in relation to the construction of Solomon's temple. The fact that it is subject to doubt makes it impossible to retain it as a conclusive argument against the theory outlined here. In the text of the famous stele dating from the fifth year of Merneptah's reign critics think they have found an objection to the theory set out here, in which the pursuit of the Jews constituted the last act of his reign. The stele is of great interest because it represents the only known document in hieroglyphics which contains the word 'Israel'. [ The word is followed by a generic determinative which leaves no doubt as to the fact that this term signifies a 'human community or group'.] The inscription which dates from the first part of Merneptah's reign was discovered in Thebes in the Pharaoh's Funeral Temple. It refers to a series of victories he won over Egypt's neighbouring states, in particular a victory mentioned at the end of the document over a "devastated Israel which has no more seed . . " From this fact it has been held that the existence of the word 'Israel' implied that the Jews must already have settled in Canaan by the fifth year of Merneptah's reign, and that in consequence, the Exodus of the Hebrews from Egypt had already taken place. This objection does not seem tenable because it implies that there could have been no Jews living in Canaan all the while there were Jews in Egypt-a proposition it is impossible to accept. Father de Vaux however, in spite of the fact that he is a supporter of the theory which makes Ramesses II the Pharaoh of the Exodus, notes [ In his book 'The Ancient History of Israel' (Histoire ancienne d'Israël)] the following about the settling of the Jews in Canaan: "In the South, the time when communities related to the Israelites settled in the Kadesh region is unclear and dates from before the Exodus." He therefore allows for the possibility that certain groups may have left Egypt at a time different from that of Moses and his followers. The 'Apiru or Habiru who have sometimes been identified with the Israelites were already in Syria-Palestine long before Ramesses II and the Exodus: we have documentary evidence which proves that Amenophis II brought back 8,600 prisoners to work as forced labourers in Egypt. Others were to be found in Canaan under Sethos I where they caused unrest in the Beth-Shean region: P. Montet reminds us of this in his book Egypt and the Bible (L'Egypte et la Bible). It is quite plausible to suppose therefore that Merneptah was obliged to deal severely with these rebellious elements on his borders while inside them were those who were later to rally around Moses to flee the country. The existence of the stele dating from the fifth year of Merneptah's reign does not in any way detract from the present theory. According to Genesis (32,29), Israel is the second name given to Jacob, son of Isaac and grandson of Abraham. The commentators of the Ecumenical Translation of the Bible-Old Testament (Traduction oecuménique de la Bible-Ancien Testament), 1975, think that its meaning is probably that 'God shows Himself in His Strength'. Since it has been given to a single man, it is not surprising that it was given to a community or group of people in memory of a distinguished ancestor. The name 'Israel', therefore appeared well before Moses: several hundred years before to be exact. It is not surprising consequently to see it cited in a stele from the reign of the Pharaoh Merneptah. The fact that it is cited does not at all constitute an argument in favour of a theory which dates the Exodus before the fifth year of Merneptah's reign. Nowadays, we know that the entry of 'Israel' into history was preceded by a long formatory period of eight or nine centuries. This period was distinguished by the settling of many semi-Nomadic groups, especially the Amorites and the Arameans all over the region. In the same period, Patriarchs began to appear in their communities among whom were Abraham, Isaac and Jacob-Israel. The second name of this last Patriarch was used to designate the original group, the nucleus of a future political entity which was to appear long after Merneptah's reign, since the Kingdom of Israel lasted from 931 or 930 to 721 B.C. 4. The Description Contained in the Holy Scriptures of the Pharaoh's Death During the Exodus. This event marks a very important point in the narrations contained in the Bible and the Qur'an. It stands forth very clearly in the texts. It is referred to in the Bible, not only in the Pentateuch or Torah, but also in the Psalms: the references have already been given. It is very strange to find that Christian commentators have completely ignored it. Thus, Father de Vaux maintains the theory that the Exodus from Egypt took place in the first half or the middle of Ramesses II's reign. His theory takes no account of the fact that the Pharaoh perished during the Exodus, a fact which should make all hypotheses place the event at the end of a reign. In his Ancient History of Israel (Histoire ancienne d'Israël) , the Head of the Biblical School of Jerusalem does not seem to be at all troubled by the contradiction between the theory he maintains and the data contained in the two Books of the Bible: the Torah and Psalms. In his book, Egypt and the Bible (L'Egypte et la Bible), P. Montet places the Exodus during Merneptah's reign, but says nothing about the death of the Pharaoh who was at the head of the army following the fleeing Hebrews. This highly surprising attitude contrasts with the Jews' outlook: Psalm 136, verse 15 gives thanks to God who "overthrew Pharaoh and his host in the Sea of Rushes" and is often recited in their liturgy. They know of the agreement between this verse and the passage in Exodus (14,28-29): "The waters returned and covered the chariots and the horsemen and all the host of Pharaoh that had followed them into the sea; not so much as one of them remained." There is no shadow of a doubt for them that the Pharaoh and his troups were wiped out. These same texts are present in Christian Bibles. Christian commentators quite deliberately, and in contradiction to all the evidence, brush aside the Pharaoh's death. What is more however, some of them mention the reference made to it in the Qur'an and encourage their readers to make very strange comparisons. In the translation of the Bible directed by the Biblical School of Jerusalem [ L'Exode (Exodus), 1968, page 73, Pub. Les Editions du Cerf, Paris.] we find the following commentary on the Pharaoh's death by Father Couroyer. "The Koran refers to this (Pharaoh's death) (sura 10, verses 90-92), and popular tradition has it that the Pharaoh who was drowned with his army (an event which is not mentioned in the Holy Text [ There can be no doubt that this commentator is referring to the Bible.]) lives beneath the ocean where he rules over the men of the sea, i.e. the seals". It is obvious that the uninformed reader of the Qur'an is bound to establish a connection between a statement in it which-for the commentator-contradicts the Biblical text and this absurd legend which comes from a so-called popular tradition mentioned in the commentary after the reference to the Qur'an. The real meaning of the statement in the Qur'an on this has nothing to do with what this commentator suggests: verses 90 to 92, sura 10 inform us that the Children of Israel crossed the sea while the Pharaoh and his troops were pursuing them and that it was only when the Pharaoh was about to be drowned that he cried: "I believe there is no God except the God in which the Chilldren of Israel believe. I am of those who submit themselves to Him." God replied: "What? Now! Thou bast rebelled and caused depravity. This day W e save thee in thy body so that thou mayest be a Sign for those who will come after thee." This is all that the sura contains on the Pharaoh's death. There is no question of the phantasms recorded by the Biblical commentator either here or anywhere else in the Qur'an. The text of the Qur'an merely states very clearly that the Pharaoh's body will be saved: that is the important piece of information. When the Qur'an was transmitted to man by the Prophet, the bodies of all the Pharaohs who are today considered (rightly or wrongly) to have something to do with the Exodus were in their tombs of the Necropolis of Thebes, on the opposite side of the Nile from Luxor. At the time however, absolutely nothing was known of this fact, and it was not until the end of the Nineteenth century that they were discovered there. As the Qur'an states, the body of the Pharaoh of the Exodus was in fact rescued: whichever of the Pharaohs it was, visitors may see him in the Royal Mummies Room- of the Egyptian Museum, Cairo. The truth is therefore very different from the ludicrous legend that Father Couroyer has attached to the Qur'an. The mummified body of Merneptah, son of Ramesses II and Pharaoh of the Exodus-all the evidence points to this-was discovered by Loret in 1898 at Thebes in the Kings' Valley whence it was transported to Cairo. Elliot Smith removed its wrappings on the 8th of July, 1907: he gives a detailed description of this operation and the examination of the body in his book The Royal Mummies (1912). At that time the mummy was in a satisfactory state of preservation, in spite of deterioration in several parts. Since then, the mummy has been on show to visitors at the Cairo Museum, with his head and neck uncovered and the rest of body concealed under a cloth. It is so well hidden indeed, that until very recently, the only general photographs of the mummy that the Museum possessed were those taken by E. Smith in 1912. In June 1975, the Egyptian high authorities very kindly allowed me to examine the parts of the Pharaoh's body that had been covered until then. They also allowed me to take photographs. When the mummy's present state was compared to the condition it was in over sixty years ago, it was abundantly clear that it had deteriorated and fragments had disappeared. The mummified tissues had suffered greatly, at the hand of man in some places and through the passage of time in others. This natural deterioration is easily explained by the changes in the conditions of conservation from the time in the late Nineteenth century when it was discovered. Its discovery took place in the tomb of the Necropolis of Thebes where the mummy had lain for over three thousand years. Today, the mummy is displayed in a simple glass case which does not afford hermetic insulation from the outside, nor does it offer protection from pollution by micro-organisms. The mummy is exposed to fluctuations in temperature and seasonal changes in humidity: it is very far from the conditions which enabled it to remain protected from any source of deterioration for approximately three thousand years. It has lost the protection afforded by its wrappings and the advantage of remaining in the closed environment of the tomb where the temperature was more constant and the air less humid than it is in Cairo at certain times of the year. Of course, while it was in the Necropolis itself, the mummy had to withstand the visits of grave plunderers (probably very early on) and rodents: they caused a certain amount of damage, but the conditions were nevertheless (it seems) much more favourable for it to stand the test of time than they are today. What may already be derived from this examination is the discovery of multiple lesions of the bones with broad lacunae, some of which may have been mortal-although it is not yet possible to ascertain whether some of them occurred before or after the Pharaoh's death. He most probably died either from drowning, according to the Scriptural narrations, or from very violent shocks preceding the moment when he was drowned-or both at once. The connection of these lesions with the deterioration whose sources have been mentioned above renders the correct preservation of the mummy of the Pharaoh somewhat problematical, unless precautionary and restorative measures are not taken very soon. These measures should ensure that the only concrete evidence which we still possess today concerning the death of the Pharaoh of the Exodus and the rescue of his body, willed by God, does not disappear with the passage of time. Those who seek among modern data for proof of the veracity of the Holy Scriptures will find a magnificent illustration of the verses of the Qur'an dealing with the Pharaoh's body by visiting the Royal Mummies Room of the Egyptian Museum, Cairo! The results of these medical studies carried out in Cairo, 1976, were read by the author before several French learned societies, including the 'Académie Nationale de Médecine' (National Academy of Medecine), during the first part of 1976. The knowledge of these results led the Egyptian Authorities to take the decision to transport the mummy of Ramesses II to France. Thus it arrived for treatment in Paris on the 26th September 1976.